Symbolically, walls stand to divide space, to enclose people and property. But for Dr. Ian Wilson and the network of medical professionals, artists, and volunteers he has organized around Rochester's annual Wall\Therapy street-art festival, and the medical-philanthropy organization Impact, walls stand for something other than themselves. Through those initiatives, walls have the capability to unite communities on local and global scales. Wall\Therapy efforts officially started in 2011. Since then more than a dozen local murals have been created by more than 20 international and local artists. These works grace the largely empty walls of Rochester; you can currently see murals from the project in the areas surrounding the Rochester Public Market and the St. Paul Quarter. Leading up to this year's Wall\Therapy event, which will see artists painting July 19-28, City caught up with Wilson and Erich Lehman of 1975 Gallery, who has taken a stronger organizing role in the effort this year. They reflected on the endeavor so far, previewed the festival line-up of artists, and discussed how they are preparing to shift the medical-philanthropy side of the endeavor to the forefront. 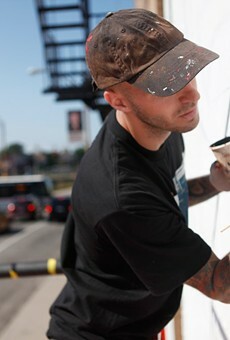 For information on and photos of the existing murals, search "Wall Therapy" at rochestercitynewspaper.com. To learn more about what's coming up, read on. In addition to adding imagery to our Image City, the impact of Wall\Therapy artwork has been massive and varied. School and other group tours still take place, locals and out-of-towners pose in front of the murals for amateur and professional photos shoots. The images are becoming as iconic to Rochester as other visible aspects of the city, including the buildings upon which they are painted. For example, Faith47's Railroad Street painting of a girl with sparrows swirling around her face is the background for a promotional photo of the Rochester musical group, Gibbs & Main. But the images weren't immediately welcomed by all. Last year, two murals in particular — Belgian artist ROA's slumbering bears, and South African artist Faith47's mural of a bare-breasted religious icon, both in the St. Paul corridor — created a bit of controversial buzz. Wilson describes the few negative responses in medical terms: "acute inflammation followed by quiescence. In other words, there was a vigorous reaction at first, which eventually healed. Some members of the community hadn't seen art on this scale, so accessible and visible. And all art is a mirror. What people see in it says a lot about themselves, and I'll continue to say that forever." But by and large, the artwork has been well received. Lehman says: "There were people within the municipality who just enjoyed the energy that was brought to the city. Not just the art, but the fact that people were in the community having a dialogue about art, for about a month." Lehman argues that the art has brought people into neighborhoods that they might not otherwise visit, creating connections that might not have otherwise happened. This year, the Wall\Therapy initiative will take place in two locations: along the El Camino Trail in the north part of the city, and through the South Wedge neighborhood in the south. Just as Wall\Therapy broke ground in the 2012 festival focal point, the Public Market area, with the Faith47, DALeast, and Freddy Sam paintings created in the summer of 2011 on Railroad Street, the organization introduced its presence to the El Camino Trail in 2012 with murals painted on the side of the Avenue D Recreation Center by San Francisco artist Siloette and New York City artist Cern. "The El Camino Trail is an area of town we wanted to work in last year," says Wilson. "But it turns out that there was kind of a natural gravitation toward the Market area, since there were so many walls concentrated in that area. It just seemed fitting to kind of focus our efforts mostly on the Market, and then offer an idea of things to come with the Avenue D Rec Center." This year, Wilson and Lehman partnered with The Genesee Land Trust, in addition to Commissioner Luis Burgos and the Department of Recreation and Youth Services, in locating walls to paint and organizing the event's presence in that area. The inclusion of the South Wedge in this year's festival grew out of casual conversations between property owners the Wall\Therapy organization, says Wilson. The Business Association of the South Wedge Area and the South Wedge Planning Committee, specifically Chris Jones of Historic House Parts and Duane Girdner of St. John's Living, reached out to Lehman and Wilson independently of each other, and almost simultaneously. In addition to the main two sites, property owners Dan and Randy Morgenstern will offer walls again in the St. Paul corridor, and Foodlink has offered walls on its building on Exchange Street. There will also likely be some work created on West Main, in the Susan B. Anthony neighborhood, and on the side of Ethiopian eatery, Natural Oasis, on Monroe Avenue. "The idea is to have some of the artists swap locations mid-week, depending on how long they'll be here in the city and depending on how fast they paint," says Wilson. "They may be able to paint in two different sections of our city, which have two completely different personalities." That not only gives artists the opportunity to vary the location in which they are painting, but also for the city to have a significant amount of public art created in about a week. In addition to the added imagery, it's an "invitation for [residents] to explore the rest of the city they live in, and to see how the two neighborhoods, north and south, are linked by this art project," says Wilson. Even though Rochester is a relatively small city, people tend to keep to their own quadrants for the most part. The festival provides a way of bridging communities within our greater community that need connections, he says. The scope of the endeavor doubles not only in location this year, but also in the number of artists who will paint the town. The 2013 line-up will include more than 25 artists, one-third of whom are locally based. Returning out-of-towners include South African-based artists Faith47 and DALeast, who have participated each year, and Freddy Sam, who came to Rochester in 2011 but not last summer. Also returning are Cern (NYC), and Siloette (San Francisco). German artist Case is also scheduled to return, but a conflict will keep him away until later in the year; organizers anticipate he'll visit in August. New to this year are Binho (Brazil), DAZE (NYC), Ever (Argentina), Gaia (NYC/Baltimore), Conor Harrington (London), Lady Pink (NYC), Jessie and Katey (Jessie Unterhalter and Katey Truhn of Baltimore), Mike Ming (NYC), Chris Stain (NYC), and Wise Two (Kenya). Freedom (NYC) came to town earlier in July and painted murals in a secret location. "One of the biggest changes this year is, whereas the 2012 year was really focused on what can be termed 'street art,' on an incredibly large scale, this year is back to the initial intended mix of what could be considered traditional graffiti, the roots of America graffiti, and modern street art," says Lehman. Lady Pink, Freedom, and DAZE "are some of the original progenitors of New York City graffiti, coming to our city to paint with our local artists, to learn about our culture and our city and our crews," he says. Baltimore-based artist Gaia will arrive a few days prior to the official festival to do a bit of Rochester research. "He's going to do a very city-specific mural. His work tends to be very much rooted in the neighborhoods and communities he's painting in, with a lot of historical context," says Lehman. Some of the non-local artists being brought in have been huge inspirations for some of our artists here in town, such as Chris Stain, who is a pioneer in stencil work. Lehman is particularly excited to about the inclusion of London-based painter Conor Harrington, whose grand-scale murals blend historic and contemporary elements in a kinetic, cinematic staging, and Mike Ming of Barnstormers crew, who attended school at RIT and was a huge eye-opener for Lehman regarding "what creativity is. He was a huge, huge personal influence," he says. Legendary street-art and graffiti photographer Martha Cooper, who helped Wall\Therapy gain international attention last year, will return this year, Lehman says. "In the last year just seeing the world's response to what we are doing here, and how well-received it is, is humbling and mind-blowing," he says. "The rest of the world is seeing what we're seeing, and why we love this place." Cooper's images of Rochester's 2012 Wall\Therapy works were posted on her blog, which is hosted at 12ozprophet.com, and were subsequently picked up by blogs and street art culture sites around the world. "We have some established artists locally whose work was so well received that it just made sense to have them participate again," says Wilson of stencil artists Thievin' Stephen and Mr. Prvrt (FUA Krew), as well as shifting-shapes painter St. Monci. Other local artists to be included this year are Bile (FFL crew), Change (FUA Krew), Range (FUA Krew), Adam Francey, Lea Rizzo, and Sarah Rutherford. The latter two artists together run collaborative art space The Yards, which again functions as the "mission control" center for Wall\Therapy. Because both Yards organizers are painting in the festival this year, they plan to begin painting a bit in advance of the other artists, and extra volunteer support will be needed at The Yards. "We need as many volunteers as possible to commit for the duration of the project," say Wilson. Organizers are still in search of people to support the artists and to provide logistic support in both the Wedge and the El Camino Trail. That includes tasks like driving artists to their mural sites, bringing them food and water, and bringing them to various eateries and areas of local interest in their free time. "To be taken under the wing of a local person just makes the experience all the more genuine and less structured," says Wilson. Because of the more ambitious scope of the festival this year, Wilson and his team launched an Indiegogo community crowd-sourced funding endeavor for $30,000, and reached their goal. "Two things pushed me toward crowd-funding this year," says Wilson. "A lot of resources have been spent personally, and I always say I couldn't have spent that money in a better way. But it is still a significant amount that I can't sustain year-to-year. The other bit is that last year we saw how many people supported our efforts...I think we were nominated for five categories [for City Newspaper's Best of Rochester survey]. It really makes sense to share ownership of something this significant with a larger group of people. I think that's the way to sustain something like this going forward — to continuously offer people who identify with the mission of this project the opportunity to support" as much as they comfortably can, he says. "With so many worthy causes vying for support, it says a lot that people are choosing to support us," says Wilson, adding that it speaks to the Rochester community's progressive thinking regarding patronage of the arts, and specifically the non-traditional arts. In addition to watching the artists' progress, the community is invited to special events during the festival that will include two block parties (one in each of the main neighborhoods where the festival will take place) with music, dancing, and food on Saturday, July 20, and Thievin' Stephen's dance party, "Floor Therapy," held at Skylark Lounge on Thursday, July 25. An artists' talk at School of the Arts will be held again this year on Wednesday, July 24. The medical philanthropy endeavor, Impact, for which Wall\Therapy is a promotional tool and fundraiser, will soon take center stage, as Wilson seeks to achieve the organization's goal of implementing medical diagnostic technology in specific third-world communities by the end of this year. Wilson traveled to Borgne, Haiti, in December 2012 as part of a delegation led by Dr. Rose-Marie Chierici, who is the founder of H.O.P.E. Haiti, a Rochester-based charity. "What I saw by putting my feet on the ground in Haiti was an amazing level of dedication by a very young staff of people to care for the community using whatever resources they have," says Wilson. "I asked the physicians how the addition of x-ray technology would enhance their ability to care for the community," he says, "and they said it would be like night and day, what they would be able to do diagnostically, and therapeutically." During his trip, the difficulty of travel in Haiti became apparent to Wilson. "Outside of Port-au-Prince, infrastructure is significantly lacking in many areas," he says. Roads to connect larger cities often times aren't paved, and depending on the weather, can be impassible because of rock slides and other hazards. Wilson says that he traveled for hours at about 3 miles per hour over rocks and boulders to get to a cholera clinic. They crossed about three rivers in a vehicle equipped with a snorkel, as well as precarious mountain passes. "And then you realize that people actually walk that distance to get to the clinic," he says. Wilson says he has seen sick and injured people carried by others on the doors to their houses to get to a clinic. The staff members "are already doing as much as they can, and their needs are much greater. They can't do any more without the support of an initiative like ours," he says. The journey emboldened Wilson to try to get the needed medical facilities funded in this calendar year. Impact will assume a larger presence in the group's promotional efforts after this summer's Wall\Therapy festival is done. "We want to weave a stronger link between the medical philanthropy and the mural art this year," he says. "The goal is to give Impact more of a presence nationally, internationally, and to get support for it. Development is the major hurdle — it's a lot of money to raise, especially when you're talking about two sites in conjunction." (The other Impact site is Cox's Bazar, in Bangladesh.) In all, the goal is to raise nearly $500,000. "Projects like Wall\Therapy continually allow us to sit down face-to-face with people who actually want to support medical philanthropy in a significant way. And those meetings are happening now," says Wilson. "There are folks in the community who have expressed interest in helping with the, frankly, more important work of all of this," he says. "Helping to preserve human life is infinitely more important." Wall\Therapy seeks not only to create connections through the celebration of art, but also to expose the community to Impact, and its mission of improving the healthcare of communities in the developing world. "Every opportunity that we had to tell that story has come about because of Wall\Therapy. So Wall\Therapy is a tremendous vehicle, a catapult for telling that story," he says. "We are going to continue to do so in a more robust way for the balance of the year and into 2014." To that end, Wilson is planning some endeavors and events for the fall, which will include a globalgiving.org campaign. "I realized that my development strategies for Impact were a little too provincial, too small, too short-sighted," Wilson says. "It makes sense that support for Wall\Therapy comes from this community because it's something that benefits this community, is visible by this community, and is something based here in Rochester." Wilson believes it makes more sense to have a similar but more widespread approach with regard to Impact, "which from its inception, by definition, is an international project." "The idea with the Global Giving campaign is to have the Haitian diaspora and the Bengali diaspora be able to support projects that are a benefit to their own communities from wherever they are, be they in the United States, in the United Kingdom, Asia, wherever," says Wilson. The goal is to get one of the projects funded, if not both of them, by the end of this year. In preparation, Impact will establish a digital presence, "so that people can learn more about what we're doing and spread the word about what we are trying to accomplish," he says. "All the pieces of the puzzle are in place, it's just a matter of funding." Learn more at wall-therapy.com. If you're interested in volunteering during the festival, email walltherapyny@gmail.com. City Newspaper will post blogs and Tweet updates during the course of the festival. Watch rochestercitynewspaper.com for updates and follow us on Twitter: @roccitynews. Public events for Wall\Therapy will be updated at facebook.com/walltherapyny/events. All events are free unless otherwise specified. Friday, July 19: Kickoff at 1975 Gallery (89 Charlotte St.) 7-10 p.m. Welcome the participating artists to town and learn more about the project from organizers. Saturday, July 20: Block Party at El Camino Trail area. Details TBA. Sunday, July 21: Block Party in the South Wedge neighborhood. Details TBA. Wednesday, July 24: Artists' Talk at School of the Arts (45 Prince St.) 6-7:30 p.m.
Thursday, July 25: "Floor Therapy" Dance Party presented by Thievin' Stephen at Skylark Lounge (40 S. Union St.). 10 p.m. $5 cover.